I had to take Sophie to DSW to exchange a pair of shoes that she got for her birthday. Shoe shopping is normally about the only kind of shopping I can stand, aside from shopping for horsie stuff at the tack shop. However, one step inside any shoe store selling stuff for fall and I start to twitch. Maybe it's me (and I'm willing to concede it probably is) but when they position some of the boots they are trying to sell as "Riding Boots. ", well, my eyes cross and I get a little squirrely. This is the result of this afternoon's trip. I'm kinda proud of it, if I do say so myself. I do that all the time. 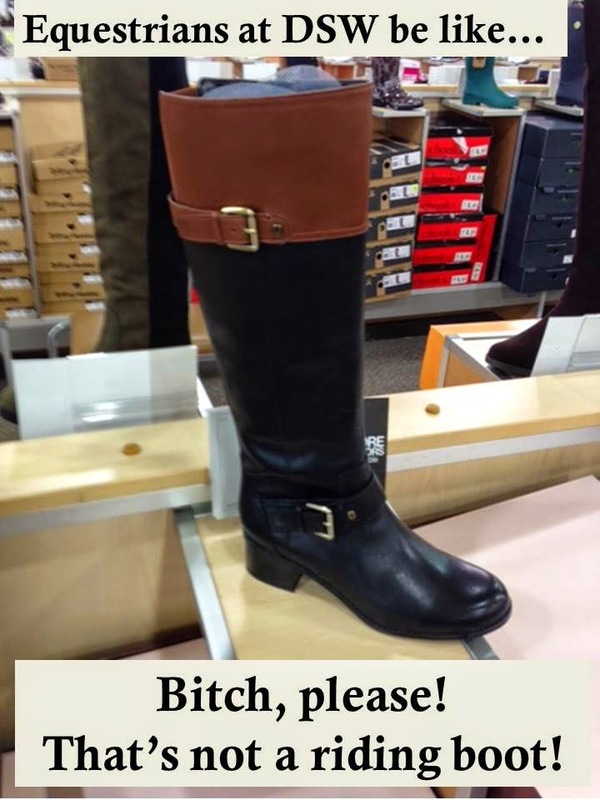 My mother and I visit DSW, she keeps pointing out boots that she just knows I'll love because they look horsey, and I get horrified. haha awesome - my thoughts exactly! For real ;D Equestrian inspired at best. Unpopular opinion: I like the fake riding boots! :x Can't take the fake breeches though!